Our Face Painting and Balloon Twisting pack is great fun for kids of all ages and when you are looking to add a bit of extra colour and fun to your party. As there are no structured games, this pack allows the kids to get a few balloons and get their face painted as they please. This pack is especially great when combined with other entertainment such as a jumping castle or for when the kids have plenty of room to run around and play amongst themselves. Our face painting and balloon twisting pack is a fun and colourful option great for any kids event as it is suitable for kids of all ages! Group sizes depend on the duration of the event. Our artists are fast and flexible and can do quick easy designs for larger groups of more detailed designs where time allows. Give us a call or email for a recommendation for your party! Face painting & Balloon Twisting can be a fantastic stand alone activity at a kids party, or you have the option to combine it with music, games, dancing, giant parachute or magic with our Little Kids Pack. For more details on our Little Kids Pack, please click here. You can also select just Face Painting or Balloon Twisting by itself. 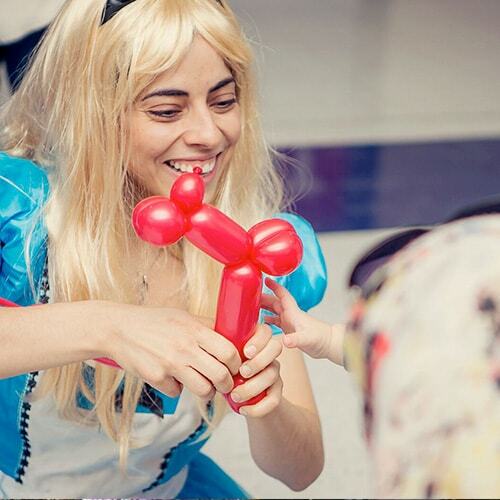 Get in touch with Amazing today to plan your perfect Face Painting & Balloon Twisting party. Request a booking today, or to speak with an Amazing Concierge, call or inquire online.